Humidity sensing technology is critical to a wide range of applications, including HVAC and refrigeration; healthcare equipment, such as CPAP machines and ventilators; asset tracking and storage devices for the food and pharmaceutical industries; industrial control systems; meteorological instruments; automotive climate control and defogging; and mobile computing devices. Despite the number of industries and applications that require it, relative humidity (RH) measurement is among the more difficult technical challenges in environmental sensing. Humidity sensing instruments typically rely on measurements of temperature, pressure, mass, or a mechanical or electrical change in a substance when moisture is absorbed from which the humidity can then be derived. Mechanical hygrometers (Figure 1) have traditionally used human or animal hair to measure humidity because the length of the hair changes measurably with increasing humidity. Nowadays, modern electronic humidity sensors operate by measuring the moisture-related changes in electrical capacitance or resistance or the temperature at which condensation appears. Some of these requirements stem from the natural characteristics of the polyimide films used in capacitive RH sensors. Others are a result of the sensor's open-cavity package that exposes the die and the sensor film to the environment. CMOS manufacturing techniques have made it possible to build state-of-the-art capacitive humidity sensors that provide innovative, cost-effective covers for the sensing element. Before taking a closer look at these single-chip humidity sensors, let's review some of the basic principles of RH measurement. The amount of water vapor found in air can vary dramatically, from close to zero to the point of saturation. Insufficient or excessive humidity, or swings between the two, can damage sensitive materials and objects. The human body uses evaporative cooling as its primary temperature-regulation mechanism. In actual fact, humans feel the rate of heat transfer from the body rather than temperature itself. Figure 2 shows how the relative humidity affects our comfort. When humidity is so high that perspiration cannot easily evaporate, the body may overheat, causing discomfort. A combination of high temperature and low RH allows more effective cooling. Traditionally, many environments have been controlled based on temperature. In recent years, the measurement of humidity has grown in importance, especially in living, storage, and manufacturing sites. Control of temperature and RH is also critical in the preservation of many materials including medications, foods, fabrics, and wood products. Unacceptable humidity levels, especially when combined with temperature extremes, contribute significantly to the breakdown of materials. Heat accelerates deterioration, and high RH provides moisture, which promotes harmful chemical reactions. When combined, these factors can encourage insect activity and the growth of mold. Extremely low RH can also have damaging effects, desiccating sensitive materials and causing them to become brittle. Large fluctuations in temperature and RH also cause damage through expansion and contraction, accelerating deterioration. Accurate humidity measurement is a vital part of controlling humidity to prevent damage, discomfort, or to detect events that may have caused product damage during storage or transit. For widespread use, RH sensing must be available in a component form that enables easy, cost-effective integration with electronic controls. Humidity can be quantified in a number of ways, but the most important measurement for maintaining atmospheric quality is relative humidity (RH). This is the ratio of the actual water vapor present in air to the amount of water vapor present in saturated air, which cannot absorb any more moisture. Absolute humidity is defined as the mass of water vapor dissolved in a total volume of moist air at a given temperature and pressure. The saturation level is generally called the dew point or frost point, depending on the temperature. The RH value can change significantly with even slight variations in temperature; a 1°C change in temperature at 35°C and 75% RH will introduce a 4% change in RH. A higher temperature increases the ability of air to absorb moisture and a lower temperature decreases its ability to absorb moisture. The RH of air decreases as the air is heated; when moist air is cooled, its capacity to absorb moisture decreases, causing the RH to increase. As a result, the amount of water vapor in air needed to reach the dew point increases with temperature. The dew point at 10°C, for example, corresponds to a RH of 26% at 32°C. The best-known instrument for humidity measurement is the psychrometer, which uses the "wet-bulb/dry-bulb" method. The device consists of two thermometers, one with an ordinary dry bulb (the dry bulb) and the other with a moist cloth covering the bulb (the wet bulb). As evaporation from the moist cloth occurs, the wet-bulb thermometer will show a lower temperature than the dry bulb as long as the air is not saturated with water vapor. A look-up table is used to derive the RH from the two temperature readings. The disadvantages of a psychrometric sensor include slow response time, large physical size, and the maintenance issues of keeping one thermometer bulb wet and ensuring good airflow around it. The current most accurate method for measuring humidity is the chilled mirror hygrometer. This technique uses an optoelectronic mechanism to detect condensation that forms on a temperature-controlled mirror surface. The mirror is maintained at an accurately measured temperature and cooled until condensation forms. The condensation scatters the transmitting LED's light, which results in a sudden drop in the output of the receiving phototransistor. The temperature at which condensation forms provides the dew point from which the humidity value can be calculated. Because of the mechanical systems they require, chilled-mirror hygrometer instruments are bulky, often expensive, and impractical for use in high-volume consumer, automotive, and residential applications. 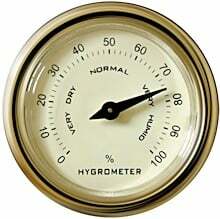 Mechanical hygrometers typically exhibit poor accuracy—often in the range of ±10%. The most common example uses a piece of animal hair kept under tension. As humidity increases, the hair relaxes and stretches and this length change can be measured by a strain gauge. Electronic humidity sensors overcome many of the size and cost problems that plague older techniques. The most commonly employed techniques rely either on a change in the resistance or capacitance of a hygroscopic material. A capacitive sensor consists of two electrodes separated by a dielectric material. Typically, as the water vapor content in the air increases, the sensor's dielectric constant increases, changing the measured capacitance corresponding to the humidity level. A resistive sensor consists of two electrodes separated by a conductive layer. In this case, variations in humidity result in changes in the conductivity of the sensing layer. New techniques for producing thin films have made these types of RH sensors accurate, stable and easy to manufacture in large quantities. The choice of hygroscopic material assures fast response times with little hysteresis. For instance, a polyimide film, which can be fabricated in thicknesses of <5 µm, can respond to changes in humidity in <10 s while providing excellent stability. The accuracy of an electronic RH sensor is limited by its drift over time, generally caused by wide variations in temperature and humidity or the presence of pollutants. To enhance the accuracy of RH measurements, it is also helpful to measure the temperature to provide temperature compensation for the RH measurement of the device if necessary. To determine the dew point or absolute humidity, the ambient air temperature is also required. For instance, a 1°C error in the measured temperature will produce approximately a 1°C error in the dew-point calculation. For the best accuracy, humidity and temperature measurements should be taken as close as possible to each other, and ideally co-located on the same chip. Such proximity can be difficult to achieve with many traditional electronic sensor designs. Many of today's electronic sensor designs use discrete resistive and capacitive sensors, hybrids, and multi-chip modules (MCMs), as shown in Figure 3. These legacy approaches suffer from high bill of materials (BOM) costs and component counts, large footprints, and the need for labor-intensive customer calibration. A further problem is that discrete sensor solutions are often incompatible with standard surface mount technology (SMT) assembly flows. The Si7005 temperature and humidity sensor from Silicon Labs addresses many of the design and manufacturing challenges posed by discrete, hybrid, and modular humidity sensor systems. The Si7005 sensor uses a hydrophobic cover material to provide lifelong protection for the sensor underneath. The cover, made from an expanded polytetrafluoroethylene (ePTFE) hydrophobic filter material, protects against dust and most liquids, and its structure allows water vapor to pass through it, ensuring that the filter does not affect sensor response time. Since the optional cover on the Si7005 sensor (shown in Figure 4) is installed at the factory, no time or labor is spent adding and removing protective tape during PCB assembly, and the cover does not have to be engineered into the product design. The Si7005 uses a polyimide film to detect changes in humidity. This thin, sensitive film is deposited over a metal finger capacitor. A precision bandgap-referenced circuit, located on the same die as the humidity sensor, provides temperature measurement. Co-location on the same die ensures that both temperature and humidity are measured in close proximity, providing exceptional measurement accuracy. If condensation gathers on the sensor, an on-chip heater can be activated to dry the sensor and restore operation once the sensor is above the dew point. The on-die temperature sensor also ensures that the microcontroller (MCU) that collects the humidity reading can take this heating effect into account. The device's long-term measurement drift due to aging is no more than 0.25% of RH/yr., which is less than half the drift of many competing devices. The specified accuracy includes an allowance for the effects of solder reflow. As a monolithic solution, the Si7005 is also factory calibrated. The Si7005 takes advantage of additional monolithic integration to ease system design and to provide the functions of much larger modules in a single, compact 4 mm × 4 mm QFN package. In addition to the sensing elements, the Si7005 integrates an ADC, signal processing, nonvolatile memory for calibration data, and an I2C interface (Figure 5). This high level of integration improves ruggedness and reliability, reduces cost and development time, and simplifies board design and also helps reduce power consumption. The Si7005 draws, on average, 1 µA when used to perform one temperature and one humidity reading per minute. Through the use of monolithic integration and innovative design, the Si7005 sensor brings cost-effective and compact RH and temperature sensing to a growing range of applications that require accurate, reliable humidity monitoring and control.